Pen-and-ink and water-colour drawing of Gopaldrug in Karnataka by Elisha Trapaud (c.1750-1828), 22 March 1799. Inscribed on the back in ink and pencil is: No.'11. Gopaul Droog. Mysore 22nd, March 1799.' Trapaud served with the Madras engineers between 1778 and 1828. He became a captain in 1784 and was appointed the Chief Engineer of Madras in 1793. He served in the Mysore Wars and was a good amateur actor. 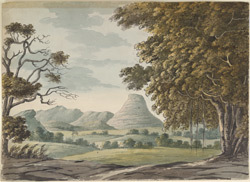 In 1788 he published a book of uncoloured aquatints titled ‘Twenty Views of India’. This image is one of 15 drawings done in South India and England. Although only two of these drawings are signed by Trapaud, all were purchased at the same time, together with an engraving on the assault of Seringapatam inscribed: 'Capt. E. Trapaud, my Great Grandfather on my Mother’s side, was at the storming of Seringapatam – his great grandson – Willoughby Briggs has his medal- given the action. Nina Macaulay.' It is not unreasonable to assume that all these sketches are by Trapaud.